Now-a-days, travelling to a long distance country or abroad has become very casual. Mostly, the businessmen frequently travel to different locations in the world and they always want to be in network with their office most of their time. Even, the regular job persons travel to different countries during their vacation holidays. At that time, they would want to contact their office frequently to know about the status of their work so that they could avoid the stress that occurs after they the job. Thus, a phone connection is a must for any individual irrespective of their job. Usually, our cell phones provide a link between us and others outside whereas the telephone at home cannot be taken anywhere else. For people who are travelling, these mobile phones could be easily carried even if they go abroad and they can utilized for making international calls at cheaper rates. Generally, the telecom service providers give their service only to certain locations, in case you want to use it for calling other countries, then you will have to pay more fees or taxes. Normally, calling a long distance number will charge you more dollars compared to the local calls but there are certain international prepaid cards available which would enable you to make international calls at a cheaper rate. Generally, with a normal phone service, you would have pay only after the usage of the service. Sometimes, this might be effective but at times, you will not be able to keep a record of all the calls you made or even if you make any long distance calls which would end up in charging with more amounts on your phone bills. But in the case of prepaid phone cards, you can use only the balance minutes or amount left on the card which would be more economical. With this method, you cannot make calls if you do not have sufficient balance on your card and can also make a note of the calls you make. 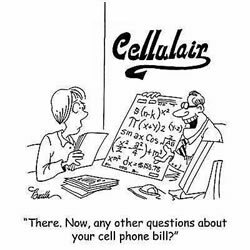 If the balance runs out, you can easily recharge and make calls again. The advantage of utilizing these prepaid telephone cards is that you need not change your mobile number often; anybody can contact you at any time to the same number. This option is very useful for the businessmen who travel frequently. You can make calls to local as well as long distance numbers with the same card. It is one of the best options since the charges are very low for making calls to local numbers. The phone service provider can be chosen according to your calling requirements. You can avail a limited validity cards with more amount of talk time, in case you always utilize very short time for making long calls. On the other hand, you can buy cards that can automatically update the validity in case you use a calling card only for incoming purpose. 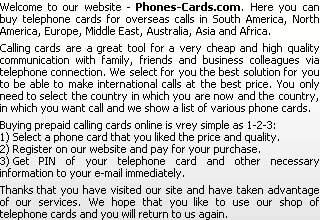 There are multitude options of phone cards available since there are numerous phone service providers. All you need is the PIN information for making calls and as long as there is sufficient balance in your card, you can very well make calls. It is always recommended to select the best service provider and the prepaid card plans depending on your calling requirements and your budget.